The relatively new and rapidly changing field of redox proteomics has the potential to revolutionize how we diagnose disease, assess risks, determine prognoses, and target therapeutic strategies for people with inflammatory and aging-associated diseases. This collection brings together, in one comprehensive volume, a broad array of information and insights into normal and altered physiology, molecular mechanisms of disease states, and new applications of the rapidly evolving techniques of proteomics. 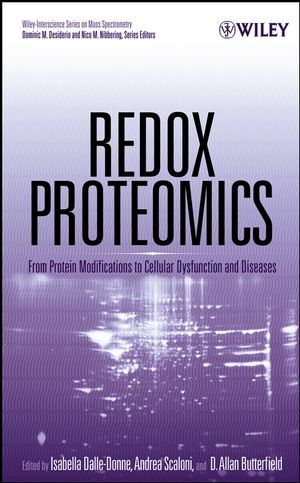 Distinguished by its in-depth discussions, balanced methodological approach, and emphasis on medical applications and diagnosis development, Redox Proteomics is a rich resource for all professionals with an interest in proteomics, cellular physiology and its alterations in disease states, and related fields. ISABELLA DALLE-DONNE, PHD, is Assistant Professor in the Department of Biology at the University of Milan, Italy. She has a PhD in cellular and molecular biology from the University of Milan. ANDREA SCALONI, PHD, is First Investigator at the Proteomics & Mass Spectrometry Laboratory, ISPAAM, National Research Council in Naples, Italy. He received his PhD in chemical sciences from the University of Rome "La Sapienza" in Italy. D. ALLAN BUTTERFIELD, PHD, is Alumni Professor of Chemistry and Director of the University of Kentucky Center of Membrane Sciences in Lexington, Kentucky, USA. He received his PhD in physical chemistry from Duke University. 1. Oxidatively Modified Proteins and Proteomic Technologies. 1.1 Chemical Modification of Proteins by Reactive Oxygen Species (E. Stadtman & R. Levine). 1.2 The Chemistry of Protein Modifications Elicited By Nitric Oxide and Related Nitrogen Oxides (D. Thomas, et al.). 1.3 Mass Spectrometry Approaches for the Molecular Characterization of Oxidatively/Nitrosatively Modified Proteins (A. Scaloni). 1.4 Thiol-disulfide Oxidoreduction of Protein Cysteines: Old Methods Revisted for Proteomics (V. Bonetto & P. Ghezzi). 1.5 Carbonylated Proteins and their Implication in Physiology and Pathology (R. Levine & E. Stadtman). 1.6 S-Nitrosation of Cysteine thiols as a Redox Signal (Y. Zhang & N. Hogg). 1.7 Detection of Glycated and GlycoOxidated Proteins (A. Lapolla, et al.). 1.8 MudPIT (Multidimensaional Protein Identification Technology) for Identification of Post-translational Protein Modifications in Complex Biological Mixtures (S. Thomas, et al.). 1.9 Use of a Proteomic Technique to Identify Oxidant-Sensitive Thiol Proteins in Cultured Cells (M. Hampton, et al.). 1.10 ICAT (Isotope-Code Affinity Tag) Approach to Redox Proteomics: Identification and Quantification of Oxidant-Sensitive Protein Thiols (M. Sethuraman, et al.). 1.11 Quantitative Determination of Free and Protein-Associated 3-nitrotyrosine and S-nitrosothiols in the Circulation by Mass Spectrometry and Other Methodologies: A Critical Review and Discussion from the Analytical and Review Point of View (D. Tsikas). 2. Cellular Aspects of Protein Oxidation. 2.1 The Covalent Advantage: A New Paradigm for Cell Signaling Mediated by Thiol Reactive Lipid Oxidation Products (D. Dickinson, et al.). 2.2 Early Molecular Events During Response to Oxidative Stress in Human Cells by Differential Proteomics (G. Tell). 2.3 Oxidative Damage to Proteins: Structural Modifications and Consequences in Cell Function (E. Cabiscol & J. Ros). 2.4 Oxidative Damage and Cellular Senescence: Lessons from Bacteria and Yeast (T. Nyström). 3. Redox Proteomic Analysis in Human Diseases. 3.1 Proteins as Sensitive Biomarkers of Human Conditions Associated with Oxidative Stress (I. Dalle-Donne, et al.). 3.2 Degradation and Accumulation of Oxidized Proteins in Age-Related Diseases (P. Voss & T. Grune). 3.3 Redox Proteomics: A New Approach to Investgate Oxidative Stress in Alzheimer's Diseases (D. Butterfield, et al.). 3.4 Oxidized Proteins in Cardiac Ischemia-Reperfusion (J. Brennan & P. Eaton). 3.5 Proteome Anaylsis of Oxidative Stress: Glutathionyl Hemoglobin in Diabetic and Uremic Patients (T. Niwa). 3.6 Glyco-Oxidative Biochemistry in Diabetic Renal Injury (T. Miyata). 3.7 Quantitative Screnning of Protein Glycation, Oxidation, and Nitration Adducts by LC-MS/MS: Protein Damage in Diabetes, Uremia, Cirrhosis, and Alzheimer's Disease (P. Thornalley). 3.8 Protein Targets and Functional Consequences of Tyrosine Nitration in Vascular Disease (L. Baker, et al.). 3.9 Oxidation of Artery Wall Proteins by Myeloperoxidase: A proteomics Approach (T. Vaisar & J. Heinecke). 3.10 Oxidative Stress and Protein Oxidation in Pre-Eclampsia (M. Raijmakers, et al.). 3.11 The Involvement of Oxidants in the Etiology of Chronic Airway Diseases: Proteomic Approaches to Identify Redox Processes in Epithelial Cell Signal and Inflammation (A. van der Vliet, et al.). 3.12 Sequestering Agents of Intermediate Reactive Aldehydes as Inhibitors of Advanced Lipoxidation End-Products (ALEs) (M. Carini, et al. ).